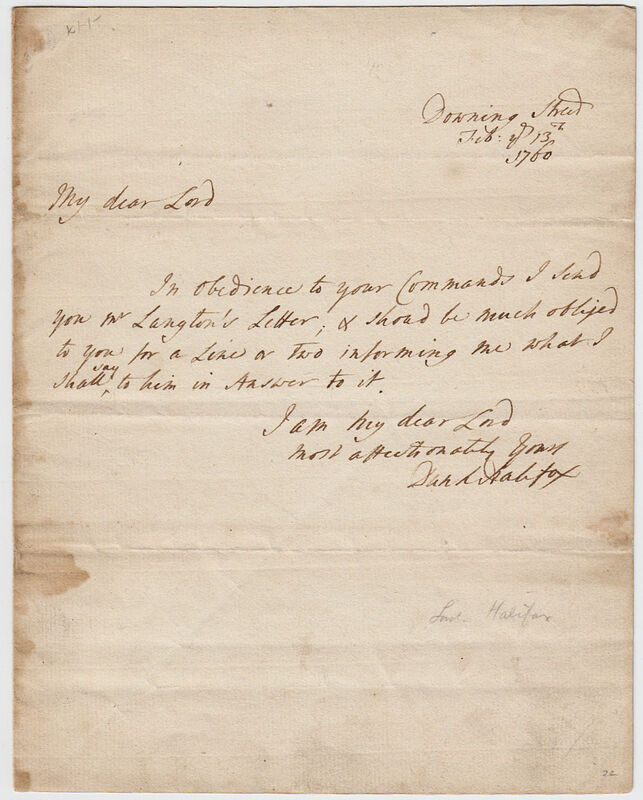 Autograph Letter Signed ‘Dunk Halifax’, addressed “My dear Lord”, forwarding Mr. Langton’s Letter. 1 page 9 x 7½ inches, integral blank leaf docketed on receipt, minor blemishes only. Downing Street, 13 February 1760. George Montagu Dunk, 2nd Earl of Halifax (1716-1771), statesman. Halifax, the capital of Nova Scotia, was named after him. In 1763, he signed the general warrant for the “authors, printers and publishers” of The North Briton number 45, under which John Wilkes and 48 others were arrested, and for which, six years later, the courts of law made Halifax pay damages.